This is such a stunning dorm wall art item! This is a dorm room decor item that you will fall in love with. This dorm wall art item features the Carousel with the lights brightly lit on the left side of the dorm poster. On the right side of this dorm necessities item is the Eiffel Tower. The combination of the Carousel and Eiffel Tower in this dorm essentials item creates a unique dorm room wall decor item. When you see college posters of the Eiffel Tower, it is usually just the Eiffel Tower in the photograph, looming large and centered in the shot. This college supplies item, however, focuses on the Carousel with the Eiffel Tower to the side for a beautiful look in this dorm room decor item. Sometimes the most stunning dorm essentials for your college wall decor are in black and white. 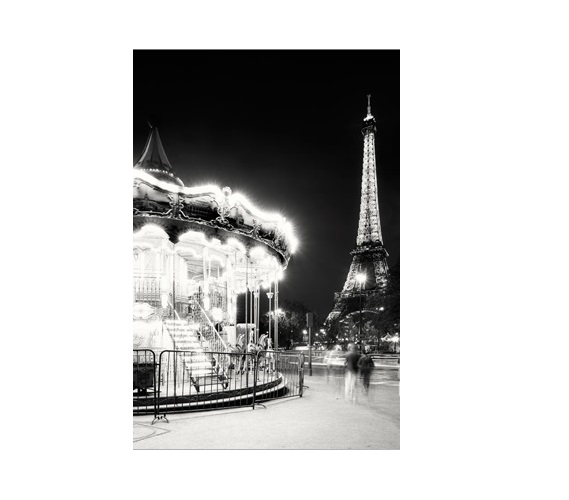 Our Paris Tower and Carousel College Poster is in black and white, and the lit up lights of the Carousel really add something to this dorm necessities item. This cool poster for dorm rooms will provide a beautiful complement to the rest of your dorm room decorations. With this dorm wall art in your dorm necessities, the colors of your other dorm supplies will pop and shine, making your overall college room decor style gorgeous and one of a kind!